The Condor Agio is the perfect all rounder, part of the touring and audax line up in Condor’s brochure it’s also capable of so much more. This Shimano Tiagra equipped test bike comes in a penny under the £1000 limit on most cycle to work schemes and therefore makes it very attractive to the year round commuter, coming with full length mudguards and rack mounts it can be used in all weathers. The frame is constructed from Fire 7003 aluminium with Dedacciai Fire carbon seat stays. As you would expect from Condor it is very well finishedl with smooth welds and a subtle yet classy dark grey paint finish. The carbon stays plug in to the frame just behind the seat stays and down to the dropouts with a nice tidy finish around the joints. Whether they do add to the comfort, it’s hard to tell but the frame does give a comfortable, almost steel like ride. With the frame weighing around 1500g and a fork weight of 580g it’s no lightweight but somehow it seems to feel lighter than it is. Sure, the acceleration is blunted but once up to speed it performs more like a race bike than a tourer. Geometry on this 55cm model is pretty standard stuff, top tube c-c 54.5cm, head tube length of 17.5cm with an angle of 73.5˚. Steering wise it’s very surefooted even at speeds above 40mph with just a touch of understeer coming through if you really push it but even this is corrected by just a slight shift in body weight. The carbon fibre Black Rain fork is also manufactured by Dedacciai, complete with carbon steerer on all sizes apart from the 61 & 64cm which has the same fork but with an alloy steerer. No flex was felt though the fork even when sprinting out of the saddle. There is also plenty of room to run mudguards and 28c tyres though the legs. In terms of finishing kit the Agio is sensibly specced, nothing to flash but everything getting the job done. The Tiagra shifting is a little vague at the lever but at the rear mech the changes are faultless. The Shimano 50/34 compact chainset married to 9spd 12/25 cassette gives a good spread of gears to get you over pretty much any terrain you might encounter. Handlebars and stem also come from Deda, oversize 31.8mm diameter with good stiffness. Whic brings me to the only thing I disliked about the whole bike – the bar tape. It looks smart in a light grey embossed with the Condor logo but for all the comfort it gives you might as well use Sellotape. With such a stiff front end some gel pads under the tape would make a huge difference especially if you’re riding audax’s or sportives. The Shimano R500 wheels did impress, at only around 80 quid a set they ride like much more expensive wheels. They stayed true over the 800 miles of testing I put them through and paired with Vitorria Rubino 28c tyres they rolled quickly and comfortably. Also looking more expensive than they are they finished off the overall classy look of the bike. Braking was again taken care of by Tiagra, although good at stopping the bike quickly there is no modulation between on and off which takes a bit of getting used to on long tricky descents. The majority of testing was done on my 34 mile round commute which it excelled at, but come the weekend and it would still be the Condor I’d grab out of the shed for a 3 hour training ride unless it was out and out speed I was after. It’s do everything attitude and ease with which it can be ridden makes it perfect for every ride. It certainly lived up to my expectations and then some. Its comfortable sure footed ride is a revelation on long rides but then if you need it you can put the power down and it changes into a completley different bike easily being flung into roundabouts flat out. No matter how big your budget the Agio should definitely be on your shortlist. Frame: Fire 7003 aluminium alloy with Deda Fire carbon fibre seat stays. Brakes-controls-mechs: Tiagra shifters, brakes, front & rear mechs. I think Condor have fulfilled their design brief, it is certainly a Jack of all trades and a master of them all. Variable throughout the frame sizes, the 55cm tested has a 73.5 degree head and seat tube giving a comfortable but responsive ride. Fairly standard stuff, a 54.5cm top tube c-c and a 55cm seat tube c-t.
Apart from the thin bar tape the ride was very comfortable, feeling solid and planted the ride feels like that of a steel bike. The Condor seat was perfectly acceptable for rides up to 3-4 hours when its stiffness started to become evident. The bike is very stiff but not so much that it gives the rider a battering. power transfer isn't wasted and the stiffness makes for a compitent descender. Even with the 700x25 tyres all the power goes straight to the rear wheel. acceleration is slightly muted due to the weight of the bike but once up to speed it is easy to keep it rolling. The steering weighted up nicely as the speed increased making for great descending. a touch of understeer was noticable but only when you are right on the limit of the tyres. The tyres are good at absorbing the road buzz while still having good rolling resistance. 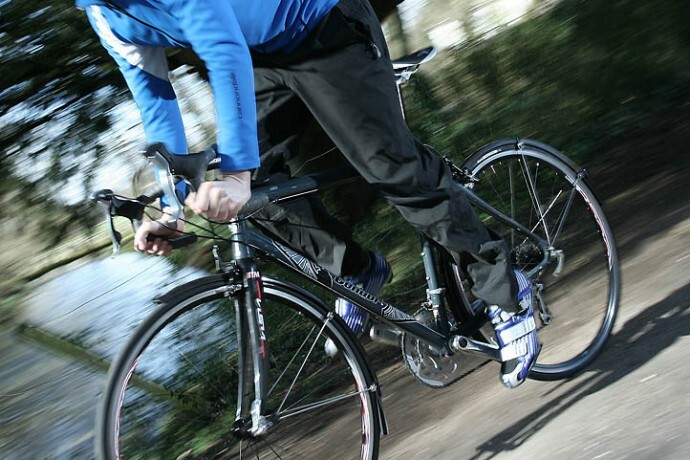 The fork and seat stays do their bit before reaching the contact points which is good as the cockpit is super stiff. No flex felt anywhere even when pulling on the bars climbing. The bars and stem being so stiff are great for feeling exactly what the bike is doing underneath you. The stiff frame keeps everything in check. If you were to change to a lighter set of wheels and tyres it would make a lot of difference to acceleration but then you would be loosing the all rounder ability of the bike. For the cost of the wheels they roll well and so do the tyres. I'd be happy to keep the wheels and tyres for commuting as they are perfectly acceptable. 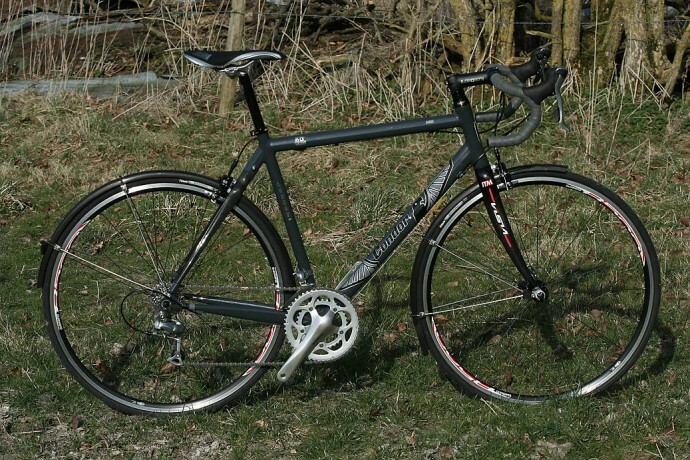 Maybe a nice lighweight handbuilt set for audax or sportives. No modulation on the brakes can make quick descending a little sketchy. Tiagra do come with spacers to make the levers come closer to the bars so would benefit smaller hands. When you take into account the build quality, handling and spec of the bike its very hard to find fault. It's obvious after riding the Agio how Condor have gained their reputation for building great bikes.